If you’re someone who enjoys solving problems using mathematics, reasoning, technology, and other unique skills, engineering may be an attractive career option for you. Engineers play an important role in nearly all the products, tools, and equipment we use on a daily basis, from automobiles and air conditioning to roads, computers, and industrial machinery. By pursuing engineering master’s programs online, you can take the next step in your career as an advanced chemical, civil, computer, electrical, industrial, or mechanical engineer. These programs equip students with advanced technical skills, usually in a specific area of focus. Software engineers with an an online master of science in engineering make an average of nearly $96,000 per year, compared to $79,100 for those who hold a bachelor’s degree alone. Some professional organizations are pushing to require individuals to have postgraduate degrees before they can receive key certifications and licenses. The Bureau of Labor Statistics reports that an engineer’s median annual salary is about $91,010, with the top 10% of earners making more than $130,000 per year. The agency also expects job growth in the engineering and architecture field to remain stable in upcoming years. Engineering is a lucrative and challenging career that continues to grow in terms of its importance and the number of jobs available nationwide. 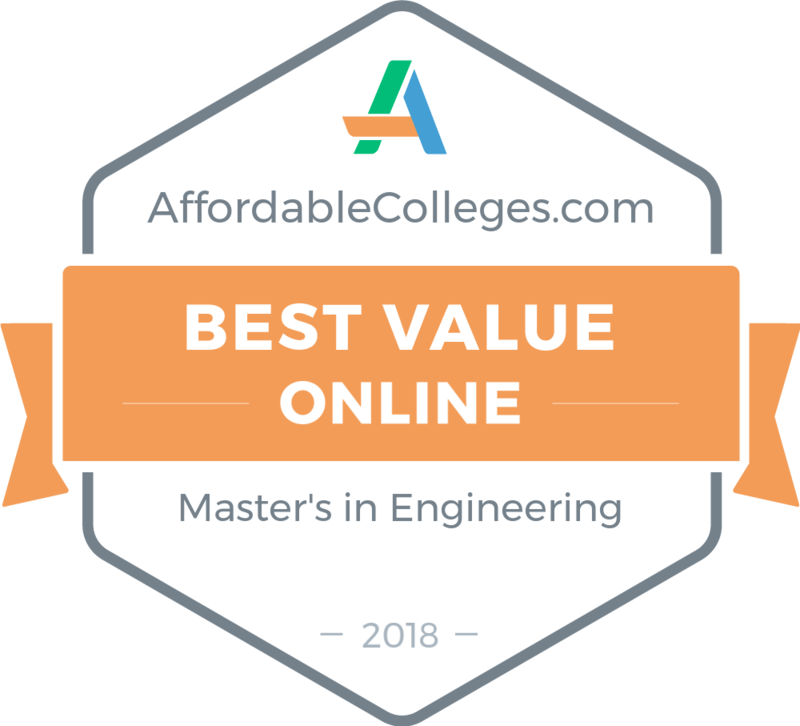 The rankings below offer a range of accredited and affordable online engineering master’s programs that allow you to achieve an advanced degree as quickly as possible, while maximizing your return on investment. Located outside Atlanta, Georgia, KSU offers some of the most affordable online engineering master's programs in the nation, including systems engineering, quality assurance, mechanical engineering, engineering management, civil engineering, and electrical engineering. Though the programs differ, they each require 30 credits, and full-time students can complete them in about a year. Certain applied programs, such as the master's in electrical engineering, offer two tracks: project and coursework. Students may choose whether to complete the bulk of their degree in the field or in the classroom. Most of KSU's online programs are taught asynchronously, and all programs are fully online, delivered through Desire 2 Learn. Most programs require a 3.5 undergraduate GPA and the GRE. Oklahoma State's OCampus offers three affordable online engineering master's degree programs in both applied and business fields: electrical & computer engineering, engineering and technology management, and industrial engineering and management. The OCampus for distance learners uses both synchronous and asynchronous learning. Though lectures are delivered live, they are available for streaming 24 hours after the class ends, and requisite compressed files are available on the course websites 24/7. Online courses require no in-person meetings. Each engineering program is overtly professional, focusing on real-world applications that prepare students for careers. Full-time students can complete any of OSU's online engineering programs in about one year. TTU offers cheap engineering master's programs online. Distance learners choose from a range of programs across the discipline, including degrees in civil engineering, engineering, healthcare engineering, mechanical engineering, and software engineering. The master's of engineering program is TTU's broadest engineering offering, allowing students to combine credits from specialized engineering disciplines. The 36-hour program is taught asynchronously and completely online. Students must pass a comprehensive exam prior to graduation. With multiple entry points throughout the year and the option to pursue part-time or full-time status, degree completion time varies by student. Course lectures are recorded in multimedia classrooms, so students may participate in real time or log on later to view the lessons. New Mexico State University offers online master's engineering programs in industrial engineering and electrical engineering. The industrial engineering program deals with business and management, and the electrical engineering program is an applied degree. Both 30-credit programs are taught asynchronously and completely online. NMSU's engineering programs are both extremely flexible. Students in the industrial engineering program may choose a hands-on project track or a traditional, course-only classroom track. In the electrical engineering program, students already working in the field can earn three credits through a technical report and oral exam. For both programs, applicants should have at least a 3.0 undergraduate GPA. Aspiring industrial engineers should have previous coursework in calculus, differential equations, probability, and statistics. Texas A&M University's distance education department ensures that students around the world benefit from its cheap online engineering master's degrees. Texas A&M offers master's programs in aerospace, biological and agricultural, computer, electrical, subsea, industrial, mechanical, petroleum, and safety engineering. Most of A&M's engineering master's programs require 30 credits and one to two years to complete. All programs are completely online and asynchronous. A&M's programs often require a hands-on capstone experience prior to graduation. Many require prior work experience and an engineering background, and some--like the master's in engineering technology and industrial distribution--require at least four years of experience in the field. Rapid City's South Dakota School of Mines and Technology offers three online master's engineering programs, which all focus on management. Entirely online options include degrees in construction engineering and management, engineering management, and mining engineering and management. Applicants should have at least one year of undergraduate mathematical experience, including basic algebra and calculus, and probability and statistics. Students applying to the construction or mining engineering programs should have work experience in their respective fields. All three programs require 32 to 33 credits, completed over one to two years. SDSMT offers an accelerated MS program, but most accepted students are SDSMT undergraduates. Boasting the largest undergraduate enrollment in the country, and a campus location next to Disney World, the University of Central Florida also offers several of the most affordable engineering master's programs in the nation, including applied degrees in mechanical engineering, materials science and engineering, industrial engineering, healthcare systems engineering, and aerospace engineering, in addition to a business-focused engineering management program. Most programs require 30 credit hours and a hands-on capstone experience. Applicants to all programs must have an undergraduate degree in mathematics, engineering, computer science, physics, or other related field, in addition to a GRE score. Courses are taught asynchronously and entirely online. The University of Nebraska at Lincoln offers a single online engineering master's program: the MEM in engineering management. Students typically complete the 30-credit program in two years and may choose to specialize in construction engineering and management. UNL's engineering management program has no minimum undergraduate GPA or entrance exam requirement, although the GRE is recommended. UNL recommends for applicants to have completed an undergraduate degree in engineering, computer science, physics, technology, or mathematics. Non-engineering students can apply to the program and complete some undergraduate engineering coursework at UNL. The entirely online program is designed with working professionals in mind--graduates do not typically pursue PhDs. NDSU offers an affordable online engineering master's program in software engineering. Students can complete the 36-credit program in one, two, or five years, depending on individual pace. In this self-paced, entirely online program, coursework is delivered asynchronously. Applicants should have an undergraduate GPA of at least 3.0 and be able to design a program of about 100 executable statements. Students should also have knowledge of at least one modern programming language, such as C++, C#, or Java. The flexible degree program allows students to customize their coursework, designing projects and major assignments around personal skill sets and professional goals. As a large research university with extensive resources, NC State offers a wide range of online master's in engineering degrees, including programs in aerospace, biological and agricultural, chemical, civil, computer, electrical, environmental, industrial, mechanical, and nuclear engineering, in addition to a broad general engineering program. NC State's general engineering program is delivered completely online--the school's WolfWare client allows students to communicate synchronously and asynchronously. Most students complete the 30-credit program in one to two years. The flexible curriculum allows students to choose courses matching their professional goals, but students must choose coursework from at least two different engineering disciplines. All applicants should have at least a 3.0 undergraduate GPA, in addition to a degree in engineering, computer science, mathematics, or physics. Located in the small town of Menomonie, the University of Wisconsin-Stout offers a single, affordable online engineering master's program in manufacturing engineering. Designed for working professionals, the online format is flexible and mostly asynchronous--requiring real-time participation in a few courses. Students who live near campus may complete the program in a blended format, combining face-to-face elements with online coursework. Students typically complete the degree in two to four years. The program requires 30 credit hours, 15 of which must be graduate-only engineering courses. Applicants must have earned an undergraduate degree in a field such as technology, engineering, mathematics, or physics and a GPA of at least 3.0. The University of Colorado at Denver offers a single, well-developed online master's engineering program; the university's affordable geographic information systems program has a narrow scope, focusing on one modern, growing, and in-demand engineering field. The program requires 30 credit hours: 27 hours of coursework and a 3-hour advanced application GIS project. Undecided students can earn a completely online certificate in GIS before pursuing the master's degree. Both the certificate and the degree are taught asynchronously and fully online, with lectures archived for 24/7 access. Graduates work in both the private (consulting) and government sectors in GIS-specific fields. The University of Houston at Clear Lake offers an affordable online engineering master's program: an MS in software engineering. The curriculum includes classes in software engineering, architecture, and processes, along with training in risk management and testing procedures. Graduates of the program work in retail, healthcare, finance, research and development, tech, and government fields. Full-time students take three courses per semester and complete the 36-credit program in about 15 months, while part-time students typically take two courses per semester and complete the program in about 24 months. Students may begin the program in the spring, summer, or fall semesters. The University of Idaho offers a wide spectrum of online engineering master's degree programs, including degrees in civil engineering, computer engineering, electrical engineering, engineering management, geological engineering, and mechanical engineering. Also available are adjacent programs in computer science and technology management. Most of the university's engineering programs require 30 credit hours, which students complete in one to two years, or three to four years for working professionals. Applicants must have an undergraduate GPA of 3.0 and about five years of professional experience in their field of engineering. As the programs are designed for full-time professionals, courses are taught asynchronously and entirely online. As a STEM-focused institution, Missouri S&T offers a range of engineering master's programs online, including degrees in aerospace, civil, computer, electrical, environmental, explosives, manufacturing, mechanical, mining, and systems engineering, along with a business-centric degree in engineering management. Missouri S&T's engineering programs require 30 credit hours, completed over one to two years, and most applied engineering programs offer thesis and non-thesis tracks. Many of the applied programs also require a three-hour, practice-oriented, hands-on project. Courses are taught entirely online and combine synchronous and asynchronous elements; students can participate in live lectures using collaboration software, but all classes are archived for access at students' convenience. GPA and entrance exam requirements vary by discipline. California State University at Fullerton offers an online engineering master's degree program in software engineering, designed for working professionals in computer science. The cohort-based model places students in groups, and they spend 22 months working through the same class schedule. The 30-credit program is offered fully online, with some synchronous elements. Distance learners may choose to participate in on-campus orientation and midpoint events. Applicants should have a 3.0 undergraduate GPA and significant work experience in the computer science field. For particularly gifted students, California State offers a parallel accelerated option, which can be completed in 17 months. Enrollment is for fall semesters only. K-State's Global Campus offers a wide variety of engineering master's programs online, including degrees in chemical; civil; electrical and computer; industrial; mechanical; nuclear; operations research; engineering management; and software engineering. Each degree program requires 30 to 33 credits. K-State's engineering programs are offered entirely online and are taught asynchronously. Applicants should have an undergraduate degree in a relevant field, such as computer science, math, or engineering, along with at least a 3.0 GPA. New students can begin in the fall or spring terms, and completion times vary; full-time students complete the programs quickly compared to working professionals, who may require up to six years. Transfer students can apply up to 10 credits toward their online master's degree at K-State. Though Indiana's Purdue University offers online engineering master's degree programs in narrow disciplines, such as mechanical and industrial engineering, the school's interdisciplinary engineering master's program stands out. Students have control over their studies, pursuing disciplines that interest them to customize their degree program. Students may concentrate in areas such as aeronautical, computational, electrical, computer, industrial, or mechanical engineering. Students may also earn a dual MBA/MSE degree, which requires a total of 60 credits. The interdisciplinary program requires 30 credit hours. Classes taught completely online, with both synchronous and asynchronous elements, and students may begin in the fall, spring, or summer terms. Applicants must have completed prior coursework in calculus, differential equations, and linear algebra. The University of Alabama at Birmingham offers an entirely online master's in engineering program with five distinct concentrations: advanced safety engineering and management, structural engineering, construction engineering and management, information engineering and management, and sustainable smart cities. Each concentration requires 30 to 36 credits and can be completed in 18 to 20 months. Most programs follow specific course sequences. All online students pay in-state tuition, and admission requires no entrance exams. Certain programs, such as information engineering, are taught synchronously; students are required to log on two nights a week and interact with peers. Other programs, such as construction engineering, are taught asynchronously. Students may begin courses in the fall, spring, or summer terms. The University of South Florida offers two engineering master's programs online: pengineering management and information technology. The IT program delves into computer science topics. The master's of science in engineering management program is delivered fully online and has operated as a distance learning program since 1985. The 30-credit program combines a management core and quantitative engineering courses with workforce management training and engineering electives. Coursework is delivered synchronously--students attend live online classes. Students may apply for the fall, spring, or summer terms. Applicants must have at least a 3.0 undergraduate GPA, and GRE scores are required. The multidisciplinary program prepares students for management and executive roles in engineering companies. The University of Florida offers a wide range of engineering master's programs online, including degrees in aerospace, civil, computer, electrical, environmental, industrial, systems, and mechanical engineering. All online engineering programs are delivered through the school's EDGE (Electronic Delivery of Gator Engineering) department. Courses are delivered asynchronously through the Canvas platform. On-campus lectures are recorded for distance learners and uploaded to Canvas the same day; online students may stream or download the lectures. None of the EDGE programs require a thesis. Programs differ in credit requirements and completion time, although 24 months is typical. Transfer students can apply previous credits toward their degrees, pending approval from the department. Mississippi State offers a wide variety of engineering master's programs online through its Center for Distance Education. Master's degrees are available in aerospace, civil, electrical, computer, industrial, and mechanical engineering. MSU also offers a general master's in engineering degree. MSU's master's in engineering program is interdisciplinary, designed to provide students (primarily professional engineers) a broad engineering background. There are no core courses; students choose disciplines that interest them and best further their professional careers. The program requires 30 credit hours, and both thesis and non-thesis options are available. Courses are delivered entirely online, and new students may enter in the fall, spring, or summer. Applicants should have a 3.0 undergraduate GPA and previous coursework in calculus, physics, chemistry, and engineering. The University of Wisconsin at Platteville offers a single online master's engineering program: a broad master's of science in engineering. Designed for working professionals, coursework draws on students' prior engineering experience, while also exposing them to different engineering disciplines. Students may earn credit for professional experience by submitting a portfolio. Courses are delivered asynchronously and entirely online through the Desire2Learn platform. Concentrations are available in engineering design, engineering management, control (electrical) systems, or structural/geotechnical engineering. Students take 12 credit hours of core engineering courses before advancing to electives and classes in their specialty. Applicants should have a 3.0 undergraduate GPA, and transfer students can bring up to 12 approved credits. Colorado State University offers several engineering master's programs online, including discipline-specific options in biomedical, civil, computer, electrical, mechanical, and systems engineering, in addition to the business-focused engineering management ME. All programs are delivered completely online, with no on-campus requirements. Across disciplines, programs require 30 credit hours, and most take two years to complete--although the civil engineering program usually takes three years. All programs offer ME degrees, but some also offer an MS degree option. Online coursework is delivered both synchronously and asynchronously through the Canvas platform. Students may be required to attend live classes. Learning resources include podcasts, recorded lectures, and articles and journals. Fayetteville's University of Arkansas offers three different engineering master's degrees online: electrical engineering, engineering management, and a general MSE degree in engineering. The MSE in engineering combines elements from both the electrical engineering and engineering management degrees. After completing a general engineering core, students take courses in specific engineering disciplines of their choosing, including biomedical, chemical, civil, computer, electrical, industrial, and mechanical engineering, in addition to engineering management. Courses are delivered entirely online, and all online students pay in-state tuition rates. Programs are divided into eight-week terms, and students can begin during spring, summer, or fall semesters. Courses are delivered asynchronously and are taught by Arkansas's College of Engineering professors. With a system of campuses across California, National University also maintains strong online education programs. The school offers a single online master's engineering program: a degree in engineering management, which includes specialization options in enterprise architecture, project management, systems engineering, and technology management. As a business-focused program, the MS in engineering management provides the business fundamentals of an MBA, while building on students' technical backgrounds and skills. The program requires 63 total quarter hours, which is comparable to a typical 30-credit-hour program. Most students complete the degree in about two years. Before delving into chosen specialties, students take 36 to 45 quarter hours of core courses in management. Coursework is delivered asynchronously and entirely online. Old Dominion University leverages 30 years of distance learning experience to offer a wide variety of master's degrees, including engineering master's programs: aerospace, environmental, computer, electrical, and systems engineering, along with engineering management. All programs are delivered entirely online by professors from the Frank Batten College of Engineering and Technology. Each program requires about 30 credit hours and a capstone or thesis project, and typical completion time is about two years. Online students do not pay in-state tuition. Most engineering offerings are ME degrees, but the aerospace engineering program offers an MS option. Courses are delivered both synchronously and asynchronously; online learning materials include live courses and downloadable resources. Known by some as the "Harvard of the Sky," ERAU focuses primarily on aviation and engineering as it relates to aviation. Embry-Riddle offers a variety of engineering master's programs online, including degrees in engineering management, entrepreneurship in technology, human factors, and systems engineering. The aerospace engineering program is the school's most popular engineering degree. The program has existed at Embry-Riddle since 1985 and is now taught entirely online. Courses are led by the same professors who teach them at ERAU's Daytona Beach campus. Students take courses in areas such as aircraft and spaceship guidance, nanomaterials, and aeroelasticity. Students complete 30 credit hours and choose between thesis or non-thesis tracks. Applicants should have a 3.0 undergraduate GPA and GRE scores. With a location conducive to the school's mining engineering focus, New Mexico Tech has recently begun offering distance programs, including two engineering master's degrees: mechanical engineering and engineering management. Students in each program complete 30 credit hours, typically over two years. Engineering management students are often working engineers interested in pursuing upper-level management positions. Mechanical engineering students are more interested in hands-on work and can choose from specializations in explosives engineering, fluid and thermal sciences, mechatronics systems engineering, and solid mechanics. Courses are delivered synchronously; students attend weekly three-hour classes using the Adobe Connect platform. Students in the mechanical engineering program choose between thesis and non-thesis tracks. All applicants should have significant work experience in the field. Alabama's Auburn University offers a wide array of engineering master's programs online, including degrees in aerospace, systems, industrial, chemical, civil, electrical, materials, mechanical, and software engineering. Though each program is different, each offers thesis and non-thesis tracks. They are taught completely online and asynchronously by the same engineering professors who teach the on-campus programs. Applicants must have an undergraduate GPA of at least 3.0, and GRE scores are required. Most of AU's MS programs require 30 to 36 credits and can be completed in about 24 months. Students may apply for fall or spring admission; however, spring admission is much more selective. Iowa State University offers an array of engineering master's programs online. Distance learners pursue degrees in aerospace, computer, electrical, energy systems, industrial, civil, mechanical, and systems engineering. ISU also offers online programs in engineering management, information assurance, and human computer interaction. All programs are taught entirely online, but delivery different methods vary. Some engineering programs are completely asynchronous and self-paced, while others are either synchronous or asynchronous and use a cohort-based model. All asynchronous courses are delivered through the Blackboard platform. Each program requires 30 credit hours, and many require at least two years of professional engineering experience. GRE scores are often required if an applicant's GPA is below 3.0. All online students pay in-state tuition. Located in Laurel, Maryland, CTU offers technology-focused master's of science programs in internet engineering and electrical engineering. Each 30-credit program is offered entirely online and is typically completed in 24 months. The electrical engineering program combines an 18-credit electrical engineering core with 6 elective credits and a 6-credit capstone. The internet engineering curriculum consists of 10 specific courses, mainly in network architecture and cloud fields. Applicants to the electrical engineering program should have undergraduate coursework in calculus, linear algebra, and engineering, in addition to MATLAB skills. Applicants to the internet engineering program should have working knowledge of object-oriented programming and, preferably, knowledge of Java and C++. Morgan State is a historically black university located in Baltimore, Maryland. The university offers a single online engineering program: the master's of science in electrical engineering. The program has four concentration options: radar, signals intelligence, power and energy, and communications. Students choose between non-thesis and thesis tracks; the former requires 33 credits and a scholarly project, while the latter requires 24 credits and two theses. Both options require 18 core electrical engineering credit hours and nine credit hours in one of the four concentrations. Applicants should have an electrical engineering undergraduate degree from an ABET-accredited school and an undergraduate GPA of at least 3.0. Students can enter in fall or spring semesters. All coursework is completely online, with no on-campus requirements. The University of Alabama in Huntsville offers a wide range of online master's programs in engineering, including engineering management, industrial engineering, operations research, systems engineering, civil engineering, mechanical engineering, and aerospace systems engineering. Each program offers thesis and non-thesis tracks. The non-thesis track includes a graduate seminar. Each engineering program requires 30 credit hours and is typically completed in about two years. UAH engineering students may choose from a wide selection of minors. Using the Canvas platform with Panopto media encoding software, UAH records and uploads lectures for streaming and download, along with lecture notes and PowerPoints. All online engineering courses are offered entirely online and include both synchronous and asynchronous elements. West Virginia University focuses on a single online master's program in engineering: the software engineering MSSE program. Designed for working professionals in the information technology and computer industries fields, the MSSE program builds on prior work experience to advance students' careers. The program is only offered part-time in a hybrid format and requires live evening courses each week. Students complete 33 credit hours of courses in software design and management. All online students at WVU pay in-state tuition. Students can begin in the fall, spring, or summer semesters. Applicants should have an undergraduate degree in computer science, a minimum undergraduate GPA of 3.0, and a good quantitative GRE score. Work experience in computer science is highly encouraged. The University of Alabama has recently begun offering distance learning degrees with its Bama by Distance program, including an MS in aerospace engineering program. The 30-credit degree is delivered completely online and asynchronously; it is designed to accommodate professional schedules. The program is identical to its on-campus counterpart. Both thesis and non-thesis tracks are offered, but most distance students choose the non-thesis route. The program combines a mathematics, aerospace, and mechanics core with 12 credit hours of electives. Applicants must have at least a 3.0 undergraduate GPA and a score of 300 on the GRE. Transfer students may apply up to 12 approved credits toward the degree. Mason's roots as a commuter school created the perfect foundation for its distance education courses. Mason offers an online master's program in systems engineering, which is taught entirely online, with no on-campus requirements. The program is designed for working engineers who intend to pursue leadership roles in their technical organizations. Systems engineering students learn to design, model, and manage network systems. Students may choose from four concentrations: architecture-based systems integration, systems engineering analysis, software-intensive systems, and systems management. The MS program requires 30 credit hours and a capstone project. Students may enter the program in the fall or spring semesters. Online students do not pay in-state tuition. Ohio University offers three online master's in engineering programs--civil engineering, electrical engineering, and engineering management--through its eCampus distance learning department. Each program offers four to seven concentrations with which students can specialize their degrees. For example, the civil engineering program offers specializations in construction management and environmental engineering, and the electrical engineering program offers hands-on options in computers, electronics, autonomous unmanned vehicles, and micro nano devices. Students typically complete the engineering programs in five semesters. All programs are entirely online and are delivered asynchronously through Blackboard. Programs differ in terms of credit requirements, but none require GRE scores for admission. Tucked in rainy, verdant Corvallis, Oregon State University offers a completely online master's degree in industrial engineering. The program focuses on management and business techniques, styled as an MBA that is customized for engineers transitioning to business. The curriculum covers areas such as project management, product development, and operations management. The degree requires 45 credit hours; 15 credits are core courses, and the rest are electives. Applicants must have an undergraduate degree in a relevant field and a GPA of at least 3.0. Since the program is designed for working engineers, work experience is preferred. Students can enroll in fall, winter, or summer terms. Most students require three to four years to complete the degree. Located in burgeoning Houston, the University of Houston has recently expanded its distance offerings, which include three engineering degrees: an MSCE in civil engineering, an MS in mechanical engineering, and an MS in subsea engineering. The MS in subsea engineering is the only program of its kind in the nation; it teaches students to construct and repair components beneath sea level. Since Houston is the "energy capital of the world," students of both the subsea and mechanical engineering programs have access to unique internships and connections. The civil engineering program provides a broad survey of different disciplines, including structural, hydrosystems, and environmental engineering. Each fully online, asynchronous program requires about 30 credits. Applicants must have an undergraduate GPA of at least 3.0 and GRE scores. Located on the eastern border of Ohio, Youngstown State University pools the resources of its science, technology, engineering, math, and business administration departments into a single online engineering master's program: the MS in engineering management. The business-focused degree turns technology workers into managers and executives. The program is offered completely online. Applicants must have an undergraduate degree in an engineering-related field and at least a 2.7 GPA. Coursework draws on disciplines such as accounting, marketing, management, finance, and industrial and systems engineering to provide students with a holistic business and engineering foundation. Most students complete the 30-credit program in two years. The University of Colorado at Colorado Springs offers online master's of engineering programs in four fields: energy engineering, engineering management, space operations, and systems engineering. The master's in energy engineering focuses on energy fields such as HVAC design and energy systems. The engineering management degree provides students with foundational business skills and offers concentrations in engineering health and business. The space operations program focuses on astronautics, space communications, and spacecraft dynamics. Finally, the systems engineering degree teaches modeling, project management, and risk analysis. Each program requires 30 credit hours and is typically completed in about two years. The energy engineering and systems engineering programs culminate in capstone projects. Applicants should have undergraduate coursework in relevant fields and a GPA of at least 3.0. Each program is taught entirely online, asynchronously, with no on-campus requirements. One of the most renowned technology schools in the country, the Georgia Institute of Technology offers a variety of engineering master's programs online, including degrees in aerospace engineering, computational science and engineering, electrical and computer engineering, industrial engineering, and mechanical engineering. Designed for working professionals looking to advance their careers, Georgia Tech's engineering programs are entirely online, asynchronous, and self-paced. Lectures are recorded and uploaded to the course website for streaming and download. While there are no GPA requirements for admission to Georgia Tech's online engineering programs, applicants must submit GRE scores. Transfer students may apply up to six approved credits toward their degree. Each engineering program offers several concentrations. The University of Cincinnati's growing distance learning program currently offers two online engineering master's degree programs, both of which are in applied fields: electrical engineering and mechanical engineering. Each hands-on degree focuses on practical application of electrical and mechanical engineering, respectively. There are no research or thesis-based courses; however, both programs involve significant business coursework, which helps graduates advance to upper-level management positions. Both programs require 30 credit hours and are typically completed in about 18 months. Applicants should have a relevant undergraduate degree from an ABET-accredited institution and a GPA of at least 3.0. All coursework is taught completely online and asynchronously. Online students pay in-state tuition. Along with more than 60 other online graduate and professional degree programs, Boston's Northeastern University offers an online master's of science degree in engineering management. Designed to teach working engineers the business skills necessary to advance to upper-level technical management positions, the MSEM program blends technology, business, and engineering. Most students complete the 32-credit program in about 24 months. Courses are delivered online and asynchronously, allowing professionals to work according to their schedules and paces. Certain courses allow optional live participation. Although there is no minimum GPA requirement, applicants should submit GRE or GMAT scores. There is no in-state tuition rate for online students. Although Washington State University does not offer a wide variety of online master's degree programs, three of them are in engineering fields: engineering and technology management, electric power engineering, and software engineering. The business-focused engineering and technology management program concludes with a hands-on capstone experience. The software engineering program deals with programming--software maintenance, testing, algorithms, and quality--and offers full- and part-time options. Coursework is delivered through Blackboard and is often taught synchronously with live lectures, while also utilizing asynchronous, cohort-based projects. Full-time students complete the 30-credit programs in about two years. Applicants should have at least a 3.0 undergraduate GPA. The University of Kentucky offers a well-established online master's degree program in manufacturing systems engineering. Taught asynchronously and entirely online, the program includes both thesis and non-thesis tracks. The multidisciplinary degree combines coursework from the mechanical engineering, electrical and computer engineering, computer engineering, chemical and materials engineering, and business and economics departments. Students gain a broad engineering background and a solid business foundation. Online students pay in-state tuition. Applicants should have an undergraduate degree from an ABET-accredited school and a GPA of at least 2.8. Most applicants are working engineering professionals who intend to advance to management positions. As the biggest university in the "Volunteer State," the University of Tennessee offers online engineering master's degree programs in four fields: civil engineering, environmental engineering, industrial engineering (engineering management), and reliability and maintainability engineering. UT's engineering programs focus on maintaining the functionality of systems through analysis and management techniques to ensure optimal efficiency. UT's reliability and maintainability engineering program is particularly popular. Applicants must choose one of six concentrations: chemical and biomolecular engineering, electrical engineering and computer science, industrial and systems engineering, materials science, mechanical, aerospace, and biomedical engineering, or nuclear engineering. Applicants must have an undergraduate degree in a relevant field. Each 30-credit program takes about two years to complete. Courses are taught entirely online and asynchronously. Located in Dayton, Ohio, Wright State University offers one of the only biomedical, industrial, and human factors engineering programs in the nation. Students of the wide-ranging degree take coursework in healthcare, manufacturing, aerospace, distribution, and retail. Students learn to design efficient systems, while factoring in human abilities and limitations. Full-time students complete the 30-credit program in two years. The curriculum includes several math-intensive courses, such as data mining, research methods, and data analysis. Students may earn up to eight credit hours from a thesis project. Courses are taught completely online. Applicants must have an undergraduate GPA of at least 2.7 and a GRE score of at least 290, with a minimum quantitative score of 145. The University of Colorado Boulder offers many affordable engineering master's degree options. Students can choose from aerospace engineering, civil engineering, computer science, electrical engineering, and engineering management, all of which are offered completely online. To apply, students must have a bachelor's degree from an accredited university with a minimum undergraduate GPA of 3.0. The master's in engineering programs all require a minimum of 30 credits to graduate, and some programs may require a thesis at the completion of study. Students must maintain a minimum 3.0 GPA on all coursework during the program. Online courses require no in-person meetings, and must be completed within six years.